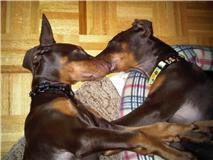 Found abandoned in a dumpster at about 6 weeks of age these two beautiful red doberman pups spent the first few weeks being nurtured back to health by a kind hearted vet. They were then transferred to the Toronto Animal Services where my sister and sister-in-law were introduced to them. Having gone to adopt a German Shepherd pup to fill the void in their home after heartbreakingly losing both of their old girls within the same year, their first introduction to the Dobies sealed the fate for one of the pups. Oskar, named in honour of Oskar Schindler went to a happy, loving home. They brought Oskar to meet us the next day. Knowing that there was another pup available, my husband and I who have a 10.5 year old Lab promised each other that we would not mention the other pup in front of our teens as we knew instantly that they would beg, plead and cry for us to adopt the brother. A second dog was not something we were willing to contemplate. However upon meeting Oskar our hearts melted and it was my hubby who surprised me as it was him who begged and pleaded that we bring the other pup into our lives in front of our kids which kind of sealed our fate. It tore at my heartstrings, knowing all these little boys had been through they deserved to grow old together, and so I broke down and it was decided that if possible we would bring him home. Unfortunately a call to the pound on Monday morning found that he was spoken for and was to be adopted on Tuesday. We told them if it fell through, and oh how we prayed it would fall through, then we wanted him. Imagine our surprise, our sheer joy upon being told on Tuesday morning that the woman had backed out, that her boyfriend wasn't willing to adopt a DOBERMAN! His loss was our gain. Wasting no time, we picked our beautiful new puppy up on the Tuesday night. We never told our kids, so it was a huge surprise to them both. We agonized over names, lots of ideas put forth, but nothing stuck until my husband said "Dexter" chosen because, as he put it "he murdered our hearts". Dexter it was, we were all in agreement. The following weekend my sister brought Oskar over and the boys were reunited. It was mayhem as they played and fought all day long, finally collapsing on their beds nose to nose, paws to paws as captured in this picture. For most of the night they curled up on one bed together, body parts hanging over the edge as they were too big to share one bed. This was the rare moment captured on film when they each slept on their own beds but maintained that closeness even in sleep. They are the best puppies we've ever had. Both are absolute cuddle bums who crave love and affection and give it constantly. So very smart and eager to please, they have both picked up on basic commands within days of coming home. Our old girl Casey is not as enamoured with her new sibling, as his energy is more than she can handle, but she has her moments were she becomes a pup again and they tossle and chase each other in the yard. She is very much the mother hen though and yells at him when he tries to roughhouse in the house. Adopting Dexter was meant to be for us and he truly is a delight to have in our lives. It disturbs me to think that someone tossed these beautiful pups out like the days garbage....and it breaks my heart to think that there may have been more that didn't make it. It makes us appreciate Oskar and Dexter all the more.